The industry was born here. 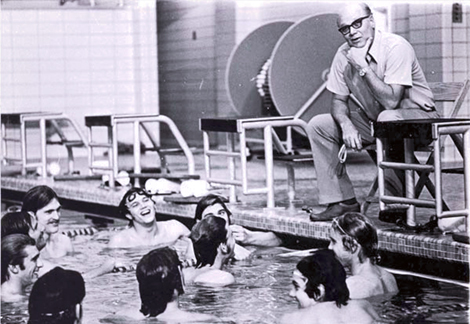 Before 1970, there were just “pools.” That same year legendary Olympic swimming coach, James E. (Doc) Counsilman, Ph.D., and former three-time National Champion and World Record Holder, Joe Hunsaker, joined forces to create what has grown to become the Aquatic Design Industry. Our two founders shared an almost spiritual passion for improving aquatics in America. They envisioned unique, exciting aquatic centers that would become centerpieces for everything from world-class competition to community recreation. Using their expert insight of aquatic needs as their motivation, the aquatic industry was revolutionized. Their advanced thinking lead to new solutions for both facility design and operational efficiency. Since our beginning, our firm has combined the art of innovative design with the science of ongoing research to develop state-of-the-art, high-efficiency aquatic centers. The talent and natural curiosity of our integrated team of designers, engineers and operational specialists is what gives Counsilman-Hunsaker the momentum to live up to the legend that was born right here.